One of my very important starting point for my creative process is to be open. I keep myself open to possibilities. I try to be open to my surroundings and to what touches me. More often than not I am tuning in to nature and that’s reflected in my work. Earlier this year I turned my attention to the human realm when the Haiti earthquake struck. I let the devastation in and a serie emerged. It’s called “Departing Souls.” It feels like a commemoration, bearing witness to lives lost. It feels like a process of honoring souls that are passing on. A world of suffering and pleas for help. A world of countless lives lost. The Encaustic Center has posted a very nice slideshow of pictures for the installation of “Two Journeys,” for the opening reception and the demos. You can see more pictures by clicking on this photo and scrolling down to “images from the reception.” I very much enjoyed doing the demo and to be able to talk about how I work. landscapes and the process of integration and movement. adopt two babies – Susan and the two years later, a brother. adoptee. My early dislike of the color yellow was closely entwined with my low self esteem as an Asian American. degree in advertising and a Master of Fine Arts degree in photography from Texas Woman’s University. “Play on word” embodies how I go about creating a piece: following my curiosity and trusting the process. It started off as an experiment. The initial idea was to brush medium gel on mulberry paper to render it transparent. It worked and when I tinted it with an ink wask , the gel medium acted a s a resist. Neat! Still, it felt like this was not a finished piece and that I needed to look further what to do with it. So I decided to see how I could play some more on the transparent effect and tried to use the mulberry piece as a layer on top of other pieces. It all came together when I laid this experiment on top of a thesaurus page that I had sketched on. It just all fit. It belonged together. I had to sneak a bit of cheese cloth thread in there for the final touch and that was that. After I finished collaging the layers, I realized that the thesaurus page contained the word “play.” One can see it through the translucent paper (top right – middle). This word indeed described both the process and the spirit of this piece. Playing with techniques, materials, words, letting them be my guide, is my way to explore and cultivate my creative voice. I once heard a presentation by Benjamin Zander and was inspired by his belief that there are untapped possibilities and connections in people. He sees his mission as someone who awakens possibilities in others. I must say he was quite convincing in his way of engaging, drawing the audience into his world, which is classical music. He has been the Boston Philharmonic conductor and his passion for classical music brought him to share it with others by inviting them to open themselves up to experience classical music, to let it pour in and to feel it. He made the spectator an actor of their own experience and it seems to me that is the way to tap into to new possibilities to make new connections. Being open, receptive is very much part of my creative process. It is through encounters of various kind that I learn to tap into new possibilities, create new connections. I am reminded that it sometimes happens in many small ways. The seemingly casual and ordinary act of choosing and picking up a certain material can be the start of an encounter where the material becomes my guide. I have had a few such encounter. One was with a paper that I brought back from Mexico. I had seen a show in Zacatecas, Mexico where Amate paper or bark paper was used. I liked what I saw so I went to the museum shop and asked with the Spanish I have where I could find it. I was directed to an art supply shop and bought several sheet of bark paper. That was 3 years ago. This spring I decided to give this paper a try for encaustic monotype. I quickly found out that with this paper, I was to take a step back and let it be the conductor if I wanted the whole process to work. I had to find a way to cooperate with the strongly textured nature of this paper, to make it work with me. So I decided to make it part of my pieces. 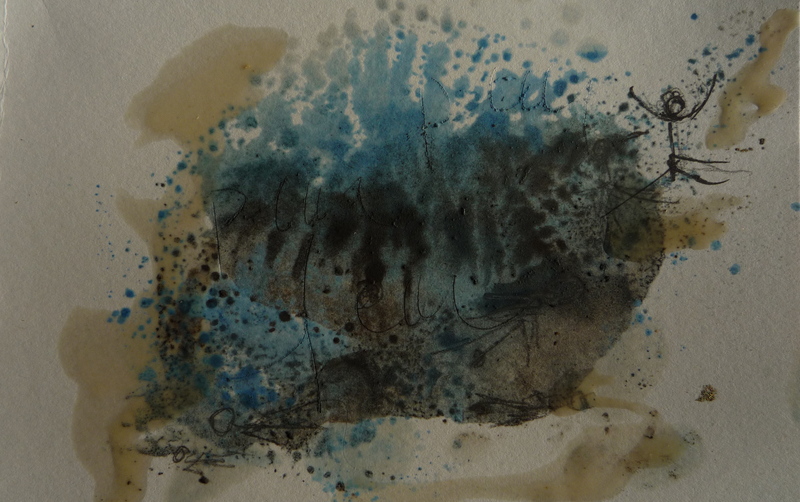 The dark unbleached pieces of bark became elements of the seascapes. They became elements in the ocean in the piece above and the contours of the clouds/horizon in this painting. 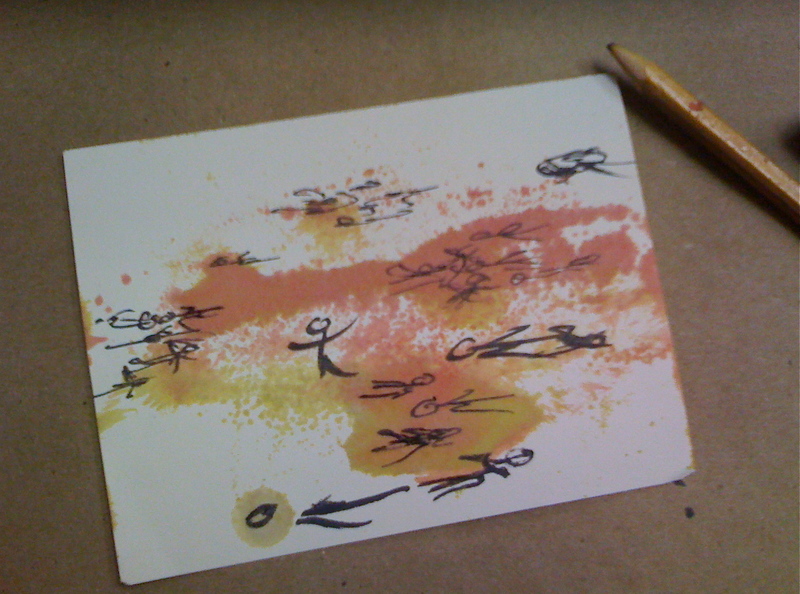 I also found out that reworking a piece the way I sometimes do was not a given with this paper. 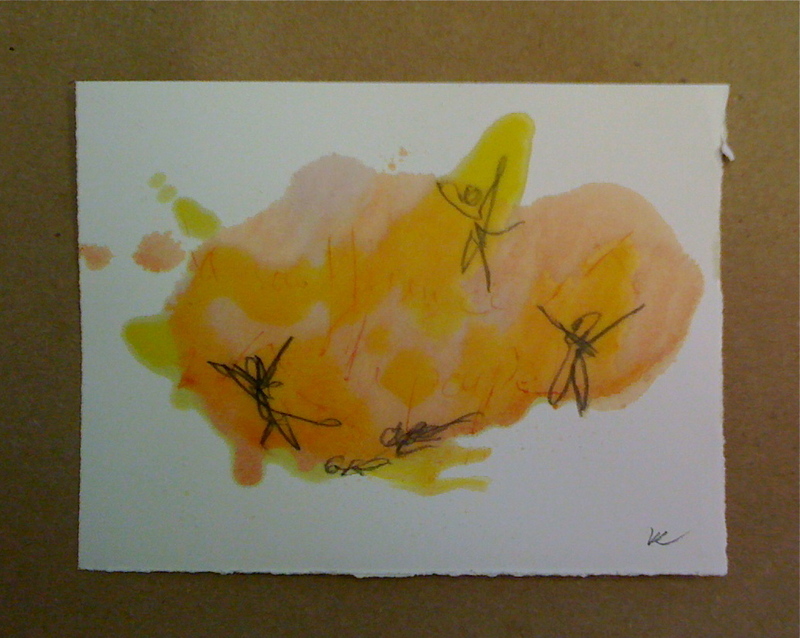 Once the encaustic paint lands on this paper, it stays there. It won’t be rubbed, moved or blended. 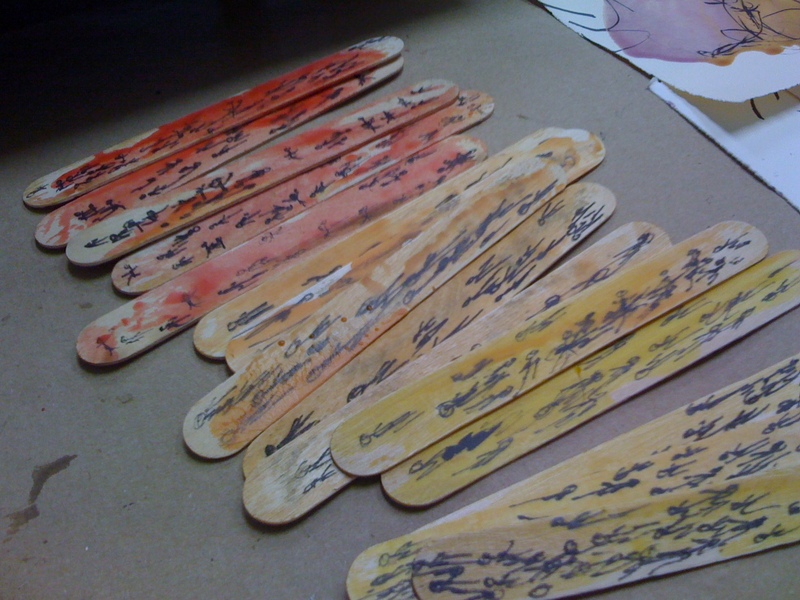 Paint can be added on top, in very small quantity, and it stays on the surface as the fiber is already thoroughly saturated from the first monotype. I find it is a paper that lends itself to be minimally handled and I learned to respect that and appreciate it. With amate paper, I also learned to do most of the work on the plate, where I can play up textures by juxtaposing brushed paint and oil pastels (red textured lines). Both get picked up and layered and intertwined. In this case, I was able to use pencil marks and to use plain medium for adding translucent shapes that feel substantial enough but also unobtrusive. With the light touch of plain medium I felt unburdened by adding more color and also like I was respecting the beautiful texture of the amate paper by not overpowering it. It seemed appropriate to let the woodsy fiber be part of the piece, a piece inspired by a tree. It is a material that indeed taught me to treat it for what it was, to play with its unique qualities, to connect with it. It did serve as guide, a conduit that allowed me to connect with my subject, a tree, and to honor both subject and inspiration. I have had such an experience where material and inspiration connect while making my own encaustic paint. I found in my stash a prussian blue pigment I had bought a few years back in Montreal at Kama Pigments. I gave it a try, using all the appropriate safety precautions (mask, gloves) and added it to the encaustic medium. What I found out is that without the oil to act as binder, the pigment tends to float in the medium, staying rather gritty. It happens to have been a happy accident and discovery, as I was working on seascapes. To have an element resembling sand seems so appropriate for a seascape like this one below! I went to the Working in Wax show at the Bedford Gallery in Walnut Creek, CA last week. I wanted to see the show and my paintings in it. The photos I had seen looked quite promising and I found it to be indeed a very inspired and inspiring show. The gallery space is well designed and bathed innatural light. It is a beautifull space to visit and to have a show at. 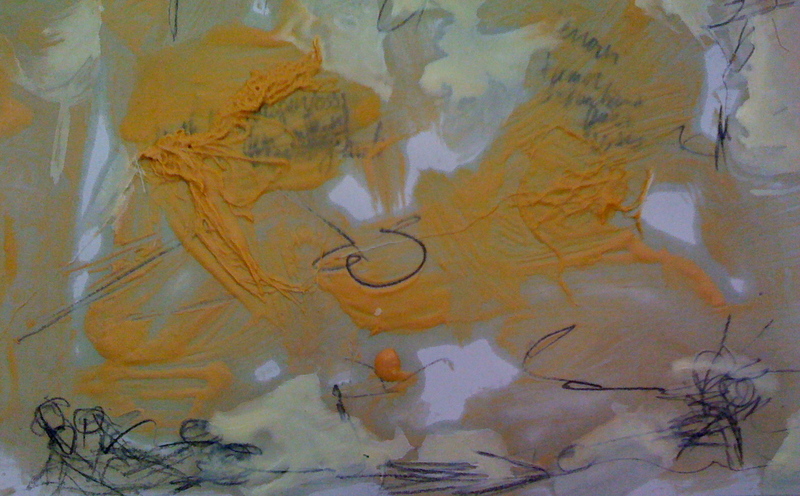 Eileen Goldenberg, the juror, filled that space with a very wide array of encaustic art and in doing so really suceeded in showing how “it gives us [artists] endless possibilities for expression.” There were works on board, on paper, on objects, some were painterly, some were sculptural, some were cast. There were some installation pieces too. My first and lasting impression of the show is about the diversity. To see such an array of materials, of approaches, dimensions, creative voice was quite inspiring and refreshing. It made being in this show, and being my first encaustic show, a truly special experience. It was yet another moment of curiosity that led me to showing my encaustic creations for the first time. I knew about the TEXASWAX/Dallas group through Deanna Wood at whose studio have been working for the past year. One day this winter, I went to look at their website: http://texaswaxdallas.blogspot.com/ There I saw a post about the Bedford Gallery, in Walnut Creek, CA. They had a call for entry for their national show. I decided to give it a try, out of curiosity. I just wanted to give it a try, get the experience to submit to a show… Well, little did I know! When I received an email from them saying that they accepted all 3 of my entries, I was pretty shocked, speechless. Then there was a moment of reckoning: I had gotten into my first show! ! And here is an other view from a distance. I find it interesting because the pieces in the foreground (and fish on the wall) definitely reference my work, wich is inspired by standing before the sea in Mexico. A coincidence? Probably not. I never know where to start but always end up somewhere! So how does it happen for me, how do I find myself on creative journeys I wasn’t even looking for but that somehow found me???? Well, I just go with and follow my curiosity. Like that one class about creativity I took one day in Montreal a few year back. Little did I know then that by simply signing up out of curiosity it would change my life, that I would go from enthusiastic art fan to actual art-maker!!! Talk about crossing the road!!!! More recently, I gave encaustic another try. I am glad I did!!! It openened an entire new realm of creative possibilites for me. Although I must say initially I was a bit put off by the process of building layers. I did end up with images nice enough but the layering bothered me. It ran against the grain for me. Luckily, I was shown how to do encaustic monotype and I took to that like fish to water!!!! That started a brand new creative journey for me. The very first thing I took note of was that this was a process of dispersion and that I was going to have to let go of controling exactly where the medium went (blue areas in the picture). Surrender became essential. While going with the flow is the way to go, there is more than one way to bring some definition, by using pastel for example (white marks), or pencil, adding fiber (silk piece collaged near the bottom), adding layers of encaustic medium or paint with a brush (black marks on the right). I find the possibilities endless and love the fact I can put the painting aside come back to it and add to it if I want. It allows me to remain open to creative possibilities of what I am playing with. And I never loose the fluid quality of my work because I can just put the image back on the plate and make it move by melting. It is a process that works so well for me. It allows me to remain entirely open and playfull.